Total Athletic Therapy: Foot Up? Hip Down? Chicken or the Egg? Foot Up? Hip Down? Chicken or the Egg? I've had this conversation with a bunch of different people when it comes to looking at the knee and what all contributes to the motions it must withstand. Which comes first? Do we control more of the resultant motion at the knee from our foot position and placement or from the control and strength we have in our hips? We will dive into that question in this post as I think I can make an argument for both sides. But first, how it all relates to the knee. The knee anatomically has a few different degrees of motion. 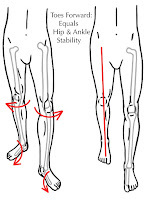 The main ones that everyone knows is flexion and extension (bending and straightening your knee). 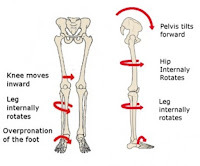 Not everyone knows that there is a degree of rotation that occurs at the knee but it is typically mainly at the end of extension and then on the invitation of flexion. The knee can move into values and varus (in and out) but that isn't what we would consider normal. The two main bones that make up your knee are the femur and the tibia and contribute most to the movement. The fibula is there along with the tibia and then the patella is obvious as it acts as a lever for movement. 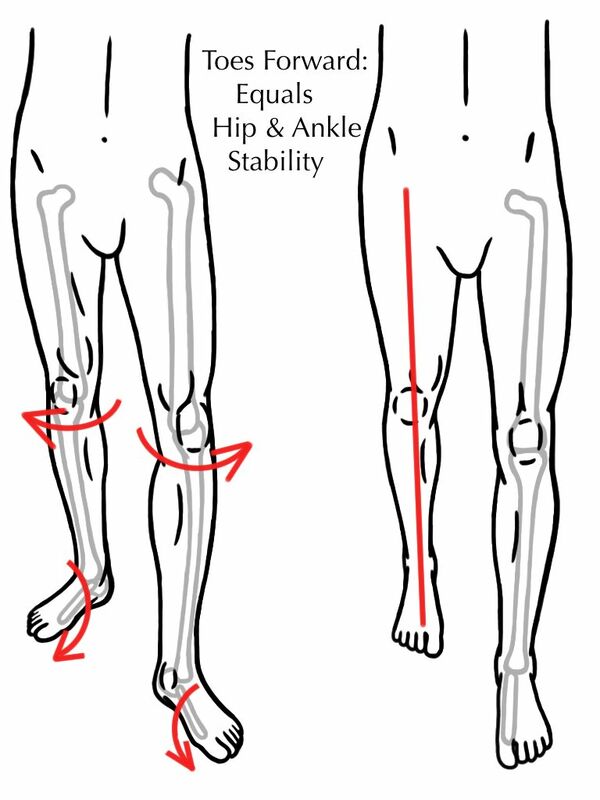 When we move, run, jump, etc we can have valgus/varus movements of the knee but that doesn't come solely from the knee joint as it has to follow either how the tibia or the femur direct it. Now onto why that might occur. start really small and get to fairly large and very strong. If you have these muscles working properly you can control so much about how your leg(s) move. 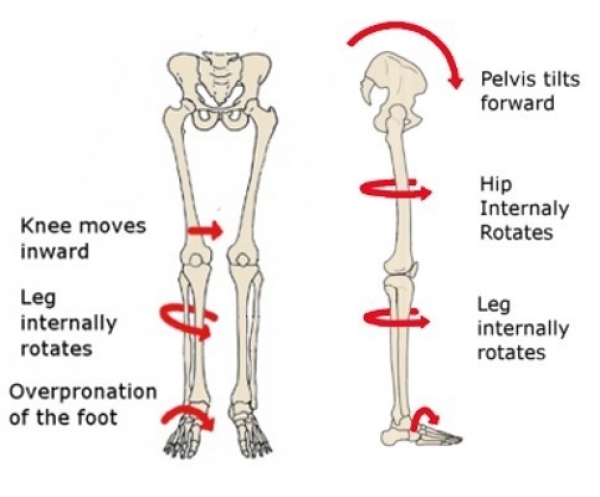 A simple test is to stand up, squeeze your glutes to rotate your leg outwards (while standing) and if you do it slowly you can feel everything rotate out through your femur, through the knee, along the tibia and even to raising up your arch. This is why we argue that increasing lateral/external hips strength and 'function' might be the most important area to start with when it comes to working on control of the knee all the way down to the foot. This is often the cornerstone of ACL prevention programs and there is often a huge area of improvement that can come from focusing attention here. I can definitely see the argument for working from the foot up and setting up a good and stable foot to help keep the knee in place. Focusing on 3 (or more depending on who you ask) points of contact and pressure on your feet (ball of foot, head of 5th MET, center of heel) you can help create a good and stable arch. This then translates into a good position for your tibia and we work back up the kinetic chain. I see this as extremely beneficial but also struggle with seeing how it then moves from the knee to the hip and controlling the position of the femur. How I like to address things is to start from the hip and work down all the while keeping your foot in a good position. This allows us to attack it from both ends and that can be very powerful. Having good control over your knee and how you are moving through both your hips and feet can have profound effects on the health of your knees and also increase your performance. Which way seems to work best for you?